De nouvelles fenêtres d'ouragan ont également été ajoutés avec de nouveaux lits et les meubles de chambre à coucher ainsi que de nouveaux meubles de salon et T. V.
Cet appareil est idéal pour les snowbirds recherchant une retraite d'hiver fabuleux pour la navigation de plaisance de la pêche et d'autres activités. Le quai est d'env. 38 'mais peut accueillir des bateaux de 50 pieds en raison de la 200' de large canal. Le quai a une nouvelle table de nettoyage du poisson et de l'eau et électrique. L'accès à l'Atlantique et du Golfe sont rapides et faciles. Vous pouvez voir les captures Charter de bateaux de la terrasse. Il y a un parcours de trous Par 3 9 côté de la rue (une ronde de golf avec des clubs revient à environ 13 $. 00). Il y a des concerts gratuits dans le parc (à distance de marche) et l'île dispose de 3 restaurants, tous à distance de marche. Il y a VTT / sentiers pédestres, des courts de tennis et la pétanque et une aire de jeux. Les femmes jouissent Ma Jong et le pont au Yacht Club (membres non requis). La navigation de plaisance, la plongée et snorkeling sont de premier ordre. Nous avons le point de vue plus large de Canal avec un chemin canal de marche agréable pour les loisirs et la socialisation. Key Colony Beach est sur une île, au cœur de la Florida Keys (marqueur de mile 53. 5 sur l'autoroute US 1). La ville, appelé le «joyau de la Florida Keys" est juste au sud de l'Overseas Highway reliée par un pont-jetée par un très petit pont. La ville a sa propre marina, magasin de pêche, magasin d'alcools, station d'essence et dépanneur. Sentez-vous libre d'appeler ou de me contacter pour toutes questions ou autre information que vous pourriez avoir besoin. 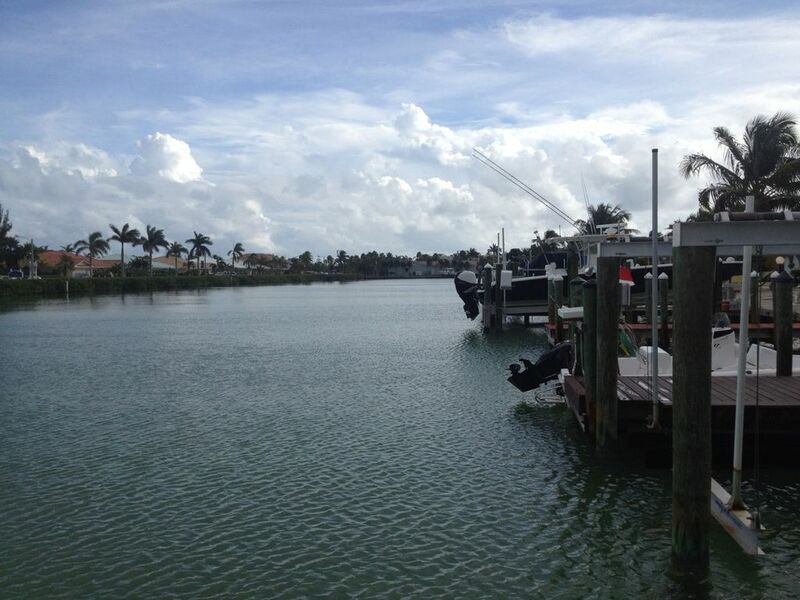 This is a great duplex with a fantastic dock right out back. The interior is clean as a whistle with all of the linens, fixtures and appliances in pretty close to brand new condition. The central A/C works great and the TV and wireless sets right up. The back porch puts you right on the dock with a great cleaning table, water and night lights. Great Boardwalk right out back. Very quiet and safe at night. Great peaceful place to relax. There are a family of manatee in the canal that come over to visit when you are washing your boat, they are very friendly and amazing to see up close. The owner (Bob) is a good man and returns your calls right away and he keeps the place in great condition. There are ample utensils and cookware in the kitchen. Golf course is across the street in front of the place. The Inn at the end of the street has great food. Once again we had an amazing revisit to this awesome place. If you are looking for a nice, quiet, clean, and comfortable place to stay this is the one. The owner is responsible and such a great person to book with. He even remembered us from two years ago and called to see how things were going during our trip. Even though we have never met in person he makes you feel like family and is so accommodating. Thanks again Bob for making our return trip spectacular and allowing us to create more memories with our son on his military leave. We are already taking about returning next year..
Our week long "guy trip" over mini-season usually takes place in Lower Matecumbe, but that fell through and we scrambled to find alternative accommodations. Someone recommended Bob's place to us, and how fortunate we were! It is clean, well-maintained, and highly functional. Nothing fancy, but everything you need, and the location in KCB is wonderful. It is central to everything in the water and on land, and has a real "community" feel that I have not found too often in the Keys. Bob was a pleasure to deal with - always responsive to questions we had before and during our stay. Overall, it was a great experience! We just wrapped up a week long stay at Robert's place. It was an awesome place to call "home" for the week! We really enjoy the Key Colony location, as it is a great "centrally located" spot to explore all the Keys have to offer. Our family of four thoroughly enjoyed fishing (and catching) from the dock and seeing the resident manatee a few times. The home was comfortable, updated, and had everything we needed to make some great memories. Robert is very accommodating, extremely responsive, and easy to work with. We will most definitely be staying at his home next summer for vacation again. Great location! This 2/2 was perfect for my family of 3. First day we walk onto dock (which is located just across from marina) and where greeted by a manatee! This is the perfect place for fishing or just recreational boating. Owner was very attentive and quick to respond. We had a great stay here for 9 days! Brought the boat down and had access to Gulf or Atlantic within 5 minutes, with several options for fuel, ice, tackle on the way out of vaca cut. My wife and daughter enjoyed the pool and beach with cabana club access. Charter boats are right across the canal if you don't bring your own boat. The unit was obviously recently updated with cold blowing central A/C, 2 full baths and kitchen updated, even a freezer on the porch for bait or catch. The patio is screened in, but we were surprised there were no bugs at this time. We could sit outside on the dock without being bit -- not sure how that was possible, but was our experience. Perfect location whether you are boating, lobstering, fishing, site seeing, it's all right there. We snorkeled coffin patch, sombrero reef, and other unnamed reefs within minutes of this location. We took my daughter to the gulf for some relaxed mangrove snapper action, targeted tarpon under 7-mile bridge, and fished the atlantic trolling and bottom fishing for more species than I can list. You can do it all easily from this location. Robert was easy to work with and accommodated us for a last-minute booking. We will be back. If you're looking for a place to stay in the middle keys, this place is hard to beat. Rates subject to change until reservation is confirmed. March Availablity FROM 1st-12th, OR 12th -19th, OR 19th - 31st.